There are many people under the illusion that to drink a great bottle of wine you have to break the bank but with so many producers around the world, with some informed spending, you can get some top wines for some decent prices. This infographic from Gourmet Heartbeat is a good place to start. It sets out a range of wines that can be purchased for great prices without compromising on price. Whites and reds are included with some decent suggestions. The infographic lists four expensive wines such as the Ramey Carneros and the Shafer Merlot - it then offers two different alternatives that are better priced but similar in taste. 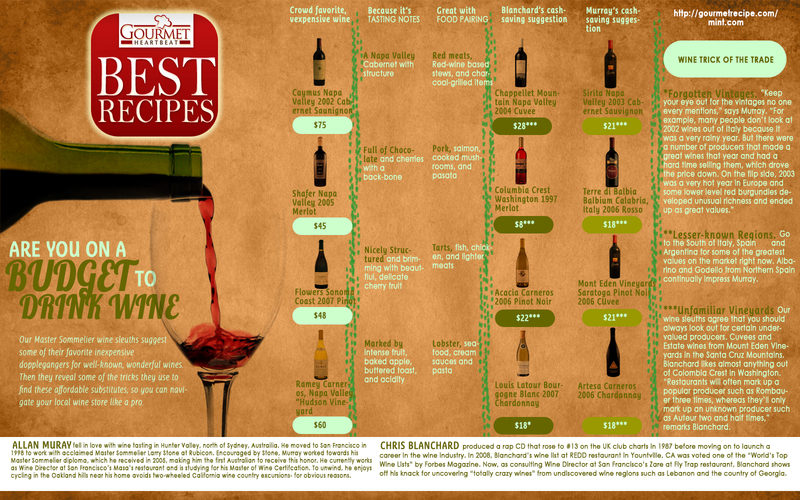 On top of the wine suggestions there's also some food pairing tips for what dishes to serve alongside the wine you choose. Facebook pushes consumers to drink, or at least to consume specific brands, as reported by a report by liquor conglomerate Diageo. Sales have jumped for Smirnoff and Baileys since they began marketing heavily on Facebook. How many times have you needed addiitional information on where to find a fast cash payday loan, and turned to an online search on "reputable payday loan companies?"